When I started this project I wanted to do something that was uniquely displayed, was permanent, was unexpected and outrageous for me, involved paint and was hidden. I specifically wanted to work with the elements of dry vs. wet to express the unique metaphor “it’s raining cats and dogs” in a whimsical way. I looked at other artists and designs in the field, and about the field, of graffiti street art to subtly influence my own project. I practiced and failed various aspects of my piece in hopes of obtaining the outcome I had envisioned in my head. Now that my work is completed I deem this project as a success. I accomplished everything that I wanted as well as broaden my scope of artistic hobbies and abilities. I actually used the elements of nature to work with art. I learned that spray paint is messy and needs to be done fast, that I don’t have a steady hand with an X-Acto knife, graffiti is not an ugly art form, and that graffiti is hard work. I feel that this project will influence my work as a graphic designer because it made me think creatively in short amount of time and to focus on various components to make a whole. This project will also push me to do things outside my comfort zone and not be afraid to try something new, which makes me a better artist and person. After pasting the rocks along the path, I quickly went to my normal Wednesday classes. At the time it was not raining but I knew that it would. Of course throughout the day it rained off an on and I knew that when my classes were done I was heading straight to the SBSB back courtyard. When I had arrived I was pleasantly relived to see my work in all its glory. The sign came out great and looked awesome with the water bubbling on top of it. 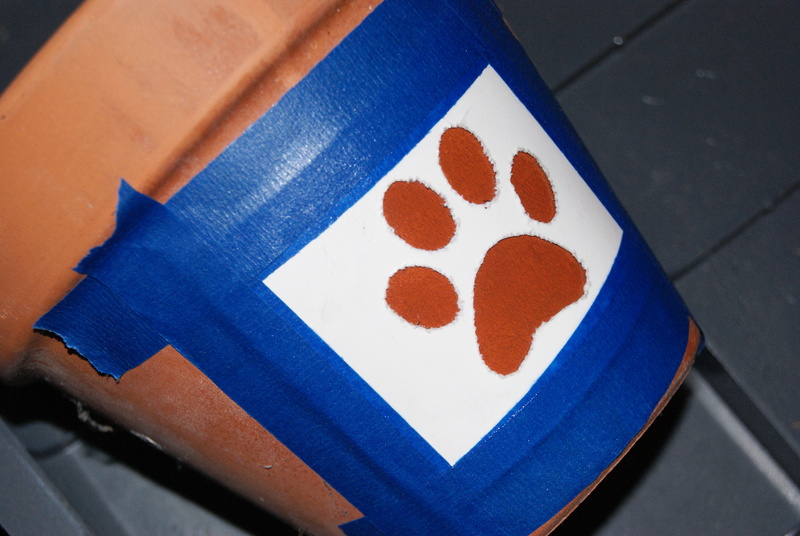 The concrete paw prints came out looking right, however I didn’t make the stencils outer edges large enough so that there was a defined edge that looks a little odd. The rocks came out very interesting. It seemed that they had came out in a success, failure pattern. The larger reddish, tan, brown, rocks looked great and were very defined. Lighter gray or white rocks didn’t even show up. The water did do the bubbling effect on them but the pattern didn’t show through when they were wet. I was little bummed that the entire piece I had put down didn’t come together they way I had hoped but overall the little success I did have out weighed the negatives. These pictures do not do this piece justice. The pictures are less defined compared to the real thing. I find it best to actually see the paw prints when the pictures are smaller and you step back from the images. The storm that was scheduled to hit San Diego early Wednesday was both a blessing and time crunch for this project. Due to the likelihood of rain in the upcoming forecast, I knew that if I didn’t paste my sign down on Tuesday, in the location I wanted, then I wouldn’t be able to complete this project. I knew that I wanted to have my project on campus and I also knew that I wanted it to be placed near the arts building but also in a somewhat hidden location. I have spent a few hours in the back court yard of SBSB and thought that the location was perfect. I specifically chose to set up my project on the walkway that comes off of the backside of the SBSB stairs and follows the curved path to the bridge. Having to move fast, at the first light that marks the path I slapped down my “it’s raining cats and dogs” stencil, tapped it tight and began to spray its entirety. I also brought along two paw print stencils to physical paste onto the concrete near the sign. I made sure to spray the sign and the paw prints evenly and was carful not to over spray them. After the first layer was dry, I sprayed the second coat, waited a few minutes, pulled up the stencils and left them to dry. Knowing that rain was to hit early the next day I hoped for success. While waiting for the sign to dry I also began picking up rocks to spray paw prints on and place into the environment the next morning. I tried to find very flat and smooth rocks ranging in various sizes. In total, I brought home roughly 40 pound of rocks. Once I got them home I tightly taped the large and small stencils to them and sprayed the first, then the second layer and then let them dry over night. In the morning, I quickly removed the stencils and attempted to put tape on the bottoms of the rocks so that when I placed them back in the bag I knew that they would go tape side down. I was unable to test all of the rocks before I left for the day and was going to have to hope for the best. Learning from the mistakes of my first attempt, I retried it again on an old clay pot. This test was much more successful. I only sprayed the pot lightly on the first and second layers and the paint seemed to stay formed to the stencil. With the success of the pot, I wanted to practice my “it’s raining cats and dogs” sign. I used an old piece of hard cardboard and was sure to keep the stencil flat and tape the edges tight. I also took extra precautions and glued down some of the corners of the letter that were sticking up, such as the G, N and the S. Once dried the sign came out just as I had expected it to and I was very happy with it. I then wanted to actually apply it in it’s permanent setting on campus. After barrowing a rock that I found on campus, I taped a small paw print stencil on top of it. After reading the direction carefully I applied the first layer of spray-paint waited for it to dry, then sprayed the second layer and let it dry. I believe that I might have sprayed too much, too close but this didn’t become apparent until I saw the final product. When I got the rock wet, rather than having the stencil be defined to where you can see all of the paw prints it came out all blobby. I did notice that the edges just out side the tape looked great. This propelled me to do a second attempt but with less pressure. Although this test was not a success I did realize that If I did the designs on rocks I could allow the project to be movable and stay on campus. I think it would be neat to have a project that is actually on campus. I created traceable designs in Adobe illustrator and then printed them out on regular sheets of paper. 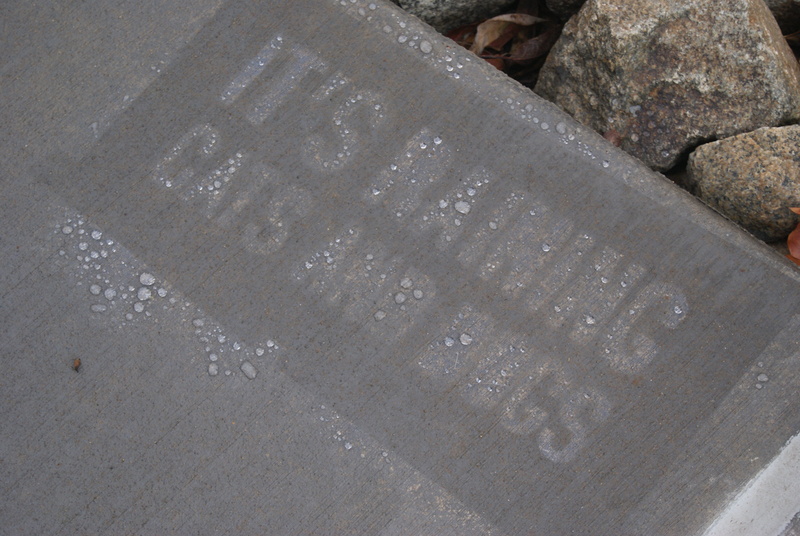 My designs were paw prints and the words “It’s raining cats and dogs.” From the regular sheets of paper, I pasted the design onto poster board. In my first attempts, I tried to cut out my stencil with an X-Acto knife. This was a failure because I don’t have a steady hand and my stencil formations looked really bad. While at the grocery store a day later, I saw one of those pumpkin carving stencil books that came with a set a tools, which gave me the idea to pierce holes along the outside of the stencil, much like the process of cutting a pumpkin. After poking holes with a pushpin I then used the X-Acto knife to follow the piercings. This resulted in a much cleaner look that I was happier with. This is a space dedicated to the process of creating an experimental art piece.